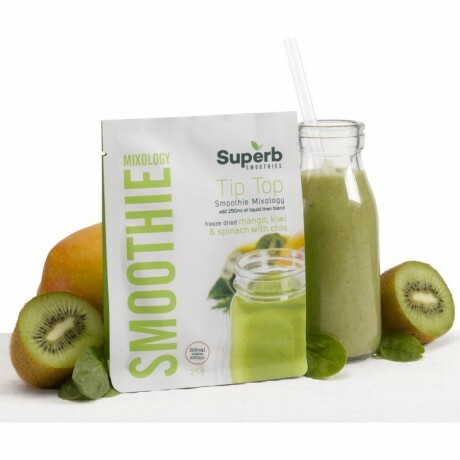 A box of 12 packs of delicious Tip Top smoothie mixes, which you can store in a cupboard until you are ready to use them. Each smoothie mix contains: 3/4 of a medium mango, 2 kiwis, 5g of white chia seed and 1 cup of spinach. Freeze dried mango (52%) freeze dried kiwi (20%), chia seeds (20%) and freeze dried spinach (8%).